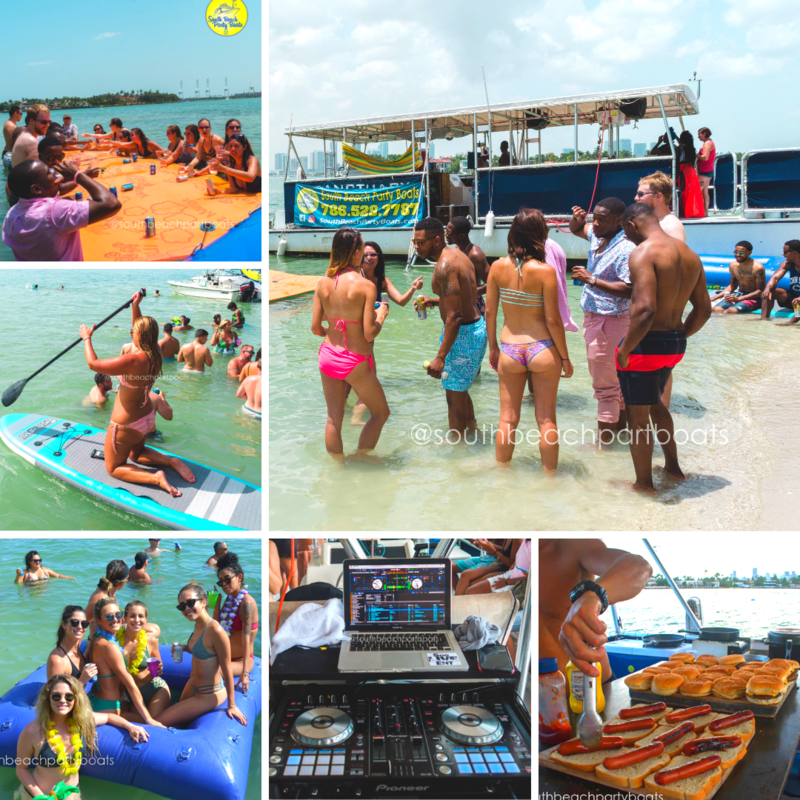 Start with a Party Boat to enjoy an all-inclusive 3-Hour access to a private island or sandbar in Biscayne Bay. Beer, wine, sodas, snacks, and stand-up paddle boards, water trampoline, floating mat. The best way to spend an awesome day on Biscayne Bay! Tour a 15-25min cruise around the celebrity homes, then arrive on a tropical sandy island or sand bar for a swim. We offer beer, wine, Tostitos, Doritos, salsa, spinach, dips, rotating menu of chicken tenders, burgers and tacos to keep the party going. Bathe in the Florida sun while the crew sets up water toys, and the music turns up. When we get to the island enjoy our trampoline floating water mat and paddle boards for your use. We choose to only carry 35 passengers, so everyone has a little time at each activity. (If you like water sports check out our Ultimate Water Sports with more activities less people.) During the trip we have huge DJ speakers in the rafter and a bar in the back of the boat, kitchenette with grill, bathroom and bar with the first mate serving you. Your trip includes free beer, wine, sodas, snacks, and a BBQ with burgers, cheese, and sausages, use of all the water toys including a water trampoline, floating water mat, stand-up paddleboards, and water noodles. Beer is a rotating stock of Bud, Bud Light, Yuengling, and Miller Lite, and there is a selection of red and white wines. Sodas include Coke, Diet Coke or Sprite. Feel free to bring your own music for our on-board sound system, BYOB if you like, and don’t forget your swimsuit and towel!